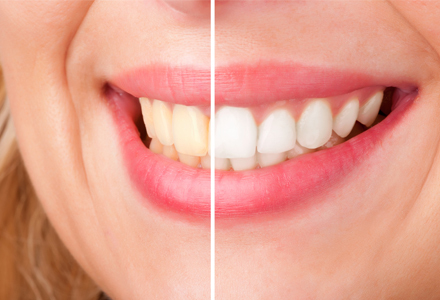 Teeth whitening is an effective way of lightening the natural colour of your teeth without damaging the tooth itself. At Home Tooth Whitening, involves taking impressions and making moulds of your teeth to create whitening trays. These are then worn at home, normally at night, for a period of 2-3 weeks. This allows you to fit the whitening around your own schedule. The darker your teeth, the longer your teeth may take to get lighter, but your dentist will be able to advise you on the expected time frame. Your smile will appear much brighter following the whitening and this can help to improve confidence and self-esteem. The effects of tooth whitening should last for up to 2 years, but will be dependent on your diet and whether you smoke. ✔ Improves appearance dramatically - It is an excellent way to improve one’s appearance and this is mainly the reason why people usually have their teeth whitened and why the teeth whitening has become widely popular among the 21st century crowd. Having a beautiful smile is now within the reach of anybody who wants it. ✔ Boosts self-confidence - looking good very often influences how people feel about themselves. Therefore, the teeth whitening process also improves a person’s self-confidence and the personal feel-good factor. ✔ Whiter teeth are associated with beauty and a healthier lifestyle - when people have a brighter smile, they tend to smile more often and are less self-conscious while interacting with people.